TO-SYN-FUEL project implements new integrated technologies in order to produce renewable liquid fuels replacing fossil fuels. These fuels are compliant with European standards for gasoline and diesel, and their production has already been demonstrated on a pilot scale. 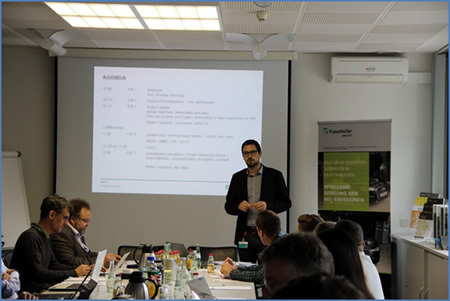 The consortium meeting has been hosted by the project coordinator Fraunhofer UMSICHT in its premises in Sulzbach-Rosenberg, Germany, on the 25th of June 2018. Discussions have taken place regarding the progress of activities relating to the research project TO-SYN-FUEL which will operate and demonstrate the production of Synthetic Fuels and Green Hydrogen from waste biomass. 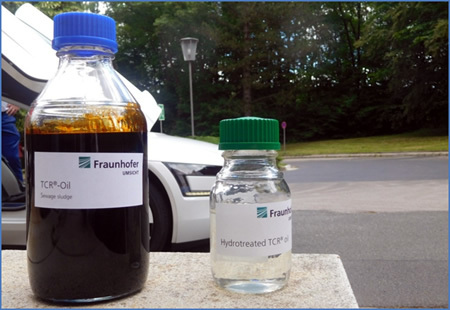 During the meeting, some samples of TCR®-Oil from sewage sludge and upgraded TCR®-Oil were shown and their characteristics and properties were explained to the project partners. 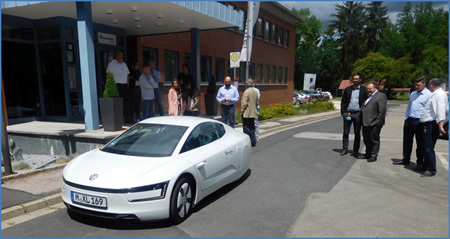 The project coordinator took the opportunity to present the limited hybrid vehicle Volkswagen XL1 to the partners. This vehicle is diesel/electro driven, and is used for road applications and promotional activities on the production and utilisation of TCR®-Diesel – upgraded TCR®-Oil produced in Fraunhofer UMSICHT laboratories in co-work with project partner VTS. The TCR®-fuel development is also supported by the Bayerische Staatsministerium für Wirtschaft, Energie und Technologie (the Bavarian Ministry of Economic Affairs, Energy and Technology). 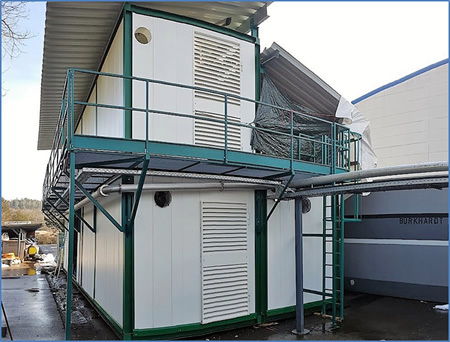 Susteen Technologies GmbH is commercializing the TCR® technology and has built the first industrial prototype with a capacity of 7 tons per day which is currently going through a rigorous test program to provide key inputs into the TO-SYN-FUEL demonstration plant. At the end of the meeting, a guided tour to the TCR®300 pilot plant was organised for the project partners. The pilot plant is within the commissioning phase at the moment and will be used to gain long-term experience from the process. These results will be part of the demonstrators design for the integration of TCR® with PSA (pressure swing adsorption) and HDO (hydrodeoxygenation) technologies for the TO-SYN-FUEL project. It is possible to follow the project development and news through the website, www.tosynfuel.eu, and the twitter account, @tosynfuel. The consortium with 12 partner organisations has brought together some of the leading researchers, industrial technology providers and renewable energy experts from across Europe, in a collaborative, committed and dedicated research effort to deliver the overarching ambition. Partners include: Engie Services Netherlands NV, HyGear Technology and Services BV, Slibverwerking Noord-Brabant NV (The Netherlands), Fraunhofer UMSICHT, Verfahrenstechnik Schwedt GmbH, Susteen Technologies GmbH (Germany), Alma Mater Studiorum – University of Bologna, ENI SpA, ETA–Florence Renewable Energies (Italy), University of Birmingham, WRG Europe Ltd (UK) and LEITAT (Spain). The project has a total duration of 48 months from May 2017 to April 2021 and will be funded by the European Union under the Horizon 2020 programme. The content of this press release cannot be considered as the European Commission’s official position and neither the European Commission, TO-SYN-FUEL project consortium nor any person acting on behalf of these organisation is responsible for the use which might be made of it. Although TO-SYN-FUEL project endeavours to deliver a high level of service, no guarantee can be given on the correctness or completeness of the content of this press release and neither the European Commission, TO-SYN-FUEL project consortium are responsible or may be held accountable for any loss suffered as a result of reliance upon the content of this press release.